Burrell just came off a slight injury to bounce back against the Red Sox tonight! We all miss Pat the Bat. Well, now that Raul is playing really well, we've taken a pause at our missing Pat a little bit and now are looking at Ibanez in a different light. Pat's started the year off differently for the Rays, he no longer plays outfield and is relegated to a DH role with the Rays. He's got one homerun and 9 rbi's heading into start of play today. Tonight against the Red Sox, Pat is already 2-3 with an RBI heading into the 6th inning. The Bat was and still is a class act, he acknowledged the fans and the city in full page ads and really was a great part of Philadelphia downtown. He was one of only a couple players that had his own luxury suite at the Citizens Bank Park. His many charitable causes did well for area youth and sick people was well known as well. We'll be watching you #5 - and we still won't forget you no matter who is playing left field for the Phillies! The merry, merry, month of May is almost here. The Phillies have an important test before them for the first ten days of this month. The Phils start out playing the arch rival NY Mets at home for three games, then go on the road for two very short series of just two games each at St. Louis and then back to New York for two at the Mets, then are home for three games against the Atlanta Braves. These 10 games will be an important test for the team. They have the month of April behind them now, and now with their 5 game win streak just broken the Phils will face some of the best pitching they've seen all year. The concern is that 9 of the Phillies 11 wins have been come-from-behind wins. The Phillies had to dazzle us with late innings heroics. I would hope this starts to change as last year the Phillies put up 39 'come-from-behind' wins and in 2007, the Phils led all MLB clubs with 48 wins that they had to win in the come-from-behind fashion. 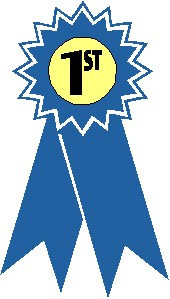 In baseball statistics, a quality start is awarded to a starting pitcher who completes at least six innings and permits no more than three earned runs. The quality start was developed by sportswriter John Lowe in 1985 while writing for the Philadelphia Inquirer. The statistic is preferred by sabermetricians to that of winning percentage (the number of wins garnered by a pitcher as a fraction of his total decisions) insofar as it acts independently of some factors beyond a pitcher's control such as fielding errors, blown saves, and poor run support. ESPN.com terms a loss suffered by a pitcher in a quality start as a tough loss and a win earned by a pitcher in a non-quality start a cheap win. 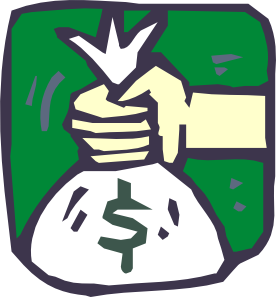 Buying Yankee tickets?, bring a big bag of money! The Phillies are suddenly looking like the World Series champs winning tonight 7-1 and making all the fans who got a Charlie Manuel bobble head doll tonight very happy as they exited the ballpark. The only bad part is Cole Hamels injury, he sprained an ankle after 4 1/3 innings and maybe on the DL with possibly a 15 day stay if he's got a somewhat severe sprain it could be more, but the good news is that Brad Lidge will not need to be on the DL with his inflammation, although if he is not feeling better after a couple of days more rest, he made need to go out on the DL. Earlier in the year, as the new Yankee Stadium opened the ticket prices were released to the public to much surprise. The amounts of the better seats were and are astronomical even with today's announcement that the Yanks have lowered some of the seats. Case in point, the $2500 seats and now lowered to $1250 per game, big deal! Read about it here from the New York Times. If there was ever a time to protest prices to games, the Yankees fans have my vote. Just go to their website and try to price a game, you'll see the prices and have the same sense of disbelief. The show is produced locally and distributed on iTunes and via the blogs- We are looking for sponsors, send us an email to phillysportstalk @ gmail.com and we'll get you lined up as a sponsor! The Phillies had a large broom out when they landed in Florida on Friday. Most of the bristles were gone by the time the three game series was over with the dramatic come from behind wins on Friday and Saturday but the Phils end up with a three game series win with Sunday's win over the hottest team in the first month of baseball: The Marlins. Hear all about what we thought about the first month on this week's edition of Philly Sports Talk Now! 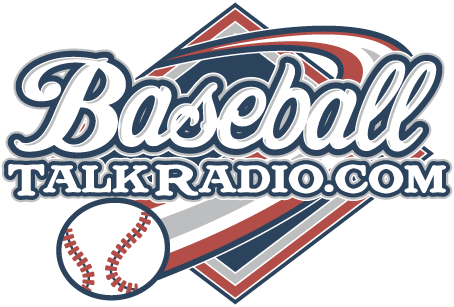 - also I will have an update of the Phillies Talk podcast in the next few days. Remember, you can download both shows at the iTunes music store and listen to us on the road as well! To say the Phillies are in place for their first sweep is the easy thing. Actually winning today will be a feat for the Phillies, as the first two games against the Marlins were won in dramatic fashion very late in the game. The Marlins have been the hottest team in baseball over the first three weeks of play. If the Phillies came out and played like them we would have all been ecstatic with the way the season started. The pitching is near last in the National League for a lot of stats, I don't even want to list them at this time. 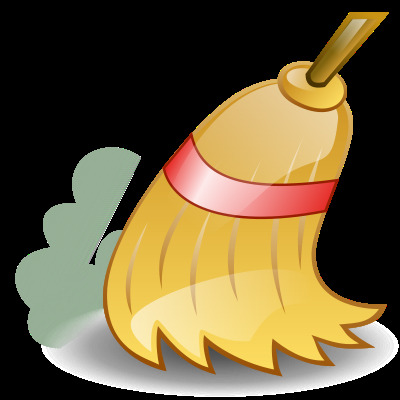 For now the broom is at the ready. Can the Phillies convert their first sweep of the year? The Phillies haven't be all that bad offensively. That's a good thing. Well, the bad thing is once the Phillies score, the team can't hold the lead for too long. Yes, I know the Phillies have been winning a couple games of late with their 9th inning heroics, but a team can't survive off of this game after game. The Phillies are still hovering around the .500 mark. The team wins one, and loses one, loses two and wins two. This is typical April baseball by the team. Last year they went 15-12 for April, with a loss in March as well. About a .500 club last year and with 5 more games to go in the month this year, the Phils look to be on pace for about the same finish. What was the Phillies best month last year? September, when they went 17-8 or .680 for the month. The strong finish helped them win the division. One series of play they could improve upon this year is Interleague play, the Phillies were 4-11 last year in that catagory. Room for improvement here is a must. Pitching this first month of the season has been not at all good either. Jamie Moyer leads the club with a 2-1 record but has a 6.35 era. Cole Hamels is 0-2 with some tough luck and possibly more bothering him. I am sure a guy though who complains about not having an chiropractor last year at his service, wouldn't be the first one to admit something is wrong. So, why would be try to hide an injury. Something is wrong though, that is obvious. Despite what the tests read. Soreness is soreness, and Hamels velocity has been down all season so far. The Phillies are still scratching and clawing along though. Much like last year, they really didn't steamroll all that many teams but found a way to come up big when it mattered. It's not only the weather in Philly that's been bad lately. The way the Phillies have been playing in April could certainly qualify as not so good. The team has sputtered, puttered, and tripped it's way to almost a .500 record the hard way. Call it ugly if you will. Even on vacation, I am keeping up with the Phillies as if I was still in the area. That's not too hard to do in Las Vegas. Everyday the odds are posted, and the Phillies haven't been real big favorites to win lately, and they sometimes haven't been winning those games that the odds makers think they'll win. There's not a whole lot of people beating the path to the betting windows to bet on the Phillies out here. The Phils certainly haven't been playing like a powerhouse World Series champion yet. Look at the Marlins, they're the hottest team in baseball. They had a horrible finish last year. Sometimes you can't figure this game out. That's baseball! Speaking of ugly. Two hour rain delay with Milwaukee tonight, but the Phils whoop them 11-4... I wish they could start doing this with a little more consistency. I just heard on WIP radio 610 am from Philadelphia that Saturday will be the memorial at CBP. 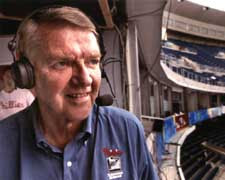 Fans may call from 8:00 am till 12:45 pm at the ballpark to pay respects to Harry Kalas. The Phillies will also wear an 'HK' inside a heart on their uniforms for the rest of this season to honor Harry Kalas, their long time broadcaster. Here is a link to a clip from WHYY TV in Philadelphia who aired a rebroadcast of "Hometown Legends" featuring Harry Kalas last night in memorial to Harry here is a link with a clip from the show about Harry and him being called, "A legend." More talk about Harry Kalas on this week's edition of Phillies Talk and Philly Sports Talk Now! on Wednesday night at 6:30 ... tune into the internet at www.phillywebcast.com to hear the show live! The Kalas family and the Phillies have announced that a memorial tribute for Harry Kalas will be held at Citizens Bank Park on Saturday. An opportunity to pay respects to the Hall of Fame broadcaster will be given on a first come, first served basis to as many fans as possible from 8:00 a.m. until 12:45 p.m. At that time, all fans in attendance will be directed to seats for an on-field tribute that will begin at 1:00 p.m.
Additional information will be made public as details are finalized. Funeral services and burial will be private and held early next week. Beginning tomorrow, players will wear HK uniform patches for the rest of the season. The black, circular HK patch will be located on the front of the jersey in the area of the heart. The Phillies return home Friday night to play San Diego at 7:05 ET. The Phillies will also pay tribute to Harry prior to the game. Fans are urged to arrive early. More details will be forthcoming. Harry Kalas, long-time Phillies broadcaster passed away today, after collapsing in the broadcast booth prior to this afternoon's game in Washington. Harry was 73 and will be sorely missed by Phils fans everywhere. He was love-able, and he did so many things for this city and team. He was privileged enough to call both World Series victories in team history, and no one could call it like he could. We lost a beloved member of the organization today, as his voice has filled so many of our homes nightly since 1971. Watching the Phillies will never be quite the same, and team president Dave Montgomery said it best, "we have lost our voice." Don't run for the fire extinguisher just yet, it's only the first week of the season. Hear all about it, on Phillies Talk - the independent podcast on the Fightin Phillies Blog! Rich Baxter of "Fightin Phillies.com" and "Phillywebcast.com"
Phillies Game Chat Live April 11 , 2009 vs. Colorado Live Now! Ryan Howard is in great shape, and his plate appearances are starting to show it. Howard has hit for more power and more for base hits rather than going for the long ball so far. His 48 HR's last year will be again tough to match, I would like to see him continue getting base hits instead of getting struck out. He only has 2 strikeouts through 3 games played so far. This is a good thing! The Phillies move onto Colorado for the second series of the year. The Rockies are 2-1 into this early 2009 season, and find themselves in first place along with the LA Dodgers out in the NL West. The Rockies have also scored 20 runs to their opponents 11 so far in the first three games. The team doesn't have a bunch of household names but it looks as if they will be a better team than last year's disappointing finish by the team of 74 wins. Most surprising in the NL East so far is the Florida Marlins, who are 3-0 to start off the season as of the morning of April 9. Good thing the Phillies pulled a miracle out of their hats yesterday. The team can't afford to lose games in bunches if they expect to hang up their with the division leaders. I know the season is young, but losing is contagious sometimes and it's not good for a team like the Phillies. Call them 'The Lords of the Rings' today, they were down 10-3 late in the game and without reason or explanation, the Phillies came all the way back from being down to win this one 12-11 with a spectacular close by Brad Lidge. Not only did the Phillies get their rings for being World Champions today, they also collected their first win of the season. Raul Ibanez was the star of the game as voted on Comcast Sportsnet, he stated that it was a team effort and that was what made the spectacular win possible today. Ibanez could be the reason that the Phillies return to the World Series again this year. 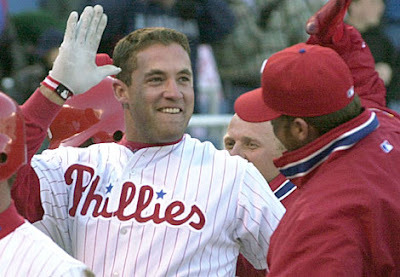 Pat Burrell got a tremendous ovation during the ring ceremony. The fans just won't let him leave town anymore without cheering him. He must feel great after so many years of playing on the team and finally winning the World Series the same year the Phillies were trying to trade him off of the team, and then eventually letting him walk away in the off season. Burrell left after the ceremonies and rejoined his new team, Tampa who was playing Boston in a night game. Burrell went 0-3 with a walk, in a Tampa win 7-2 over the Red Sox. The Phillies dropped another game to the Braves and find themselves 0-2 in the first two games of the year. Again the offense didn't get started for the Phillies. The Braves got the hits they needed from a red hot Chipper 'Larry' Jones again, as he is picking up where he left off last year. None of the Phillies stars could do what they do best tonight and the team just can't seem to get it started yet offensively. The Opening Night ceremonies were nice, but very distracting to the players apparently. There was a couple of gaffs in the ceremony. One of them was the ladder that Charlie Manuel thought he was going to walk down onto the field was abruptly pulled away before he got there, and even people in the crowd were at bit surprised that they left Charlie out there in Ashburn Alley to find his own way back onto the field. The ring ceremony will be another distraction on Wednesday, it's a necessary distraction but it's one that will be nice to experience but also get this one behind the team so it can start concentrate on playing baseball and not so much mug for cameras and try to be too cute. The team is playing through all of this pomp and circumstance and not playing all that well. The fans that booed the team on Opening Night should be ashamed. It's a national disgrace to boo a team that won a World Series on Opening Night no matter what happens. This is what makes me wonder about some Philly fans. I wonder what makes them tick, what would inspire them to be so despicable to boo the World Champions. I question their allegiance to the team and their integrity and they know who they are! The Phillies really don't do that well on Opening Days. In the last 15 years, the Phillies have won just 5 Opening Day games. So last night's loss comes as no surprise. The offensive snooze the Phillies took could have been courtesy of Derek Lowe, who pitched a great game. Lowe kept the ball down and was getting the borderline strike calls from the umpire alot. Brett Myers made a couple of bad pitches and the Braves took him deep more than the two homeruns that Myers gave up. On the standpoint of that, Myers didn't pitch all that well last night, but didn't display his worst stuff either. Game 2 is Tuesday night, let's hope the offense regroups and has a better night. I haven't been this excited about Opening Day in a while, normally I am thrilled to just hear that opening day is here, but now that's been taken to a new height that the defending champs of the MLB are back to work starting tonight. 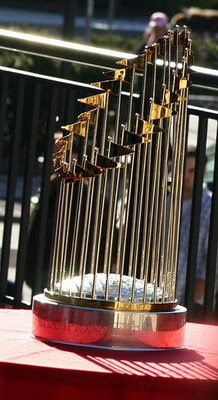 I was 15 years old when the Phillies first won it all back in 1980, the only other time that the team has won the coveted title before 2008. I remember all the players back then, the great names like Schmidt, Rose, Carlton, and others. That 1980 team seems like a lifetime ago now, an era that will never return but the memory still lingers. 1980 was not unlike today in several ways. The world back in 1980 wasn't a very nice place, gas prices were an issue, world peace was at odds with names like the Shah of Iran, and John Lennon of the Beatles was shot and killed in December of 1980. CNN didn't exist in 1980, nor did personal computers for that matter that you could read blogs like this one. The world was a much different place. Not necessarily worse mind you, but different. Computers and cell phones were in their infancy and only the super rich started off with them so for the common person they didn't really exist. In 1980 the Phillies defeated Kansas City for the World Series title 4 games to 2, and the Philadelphia Flyers were also in the Stanley Cup that year just falling short and losing against the 4 games to 2 against the NY Islanders. 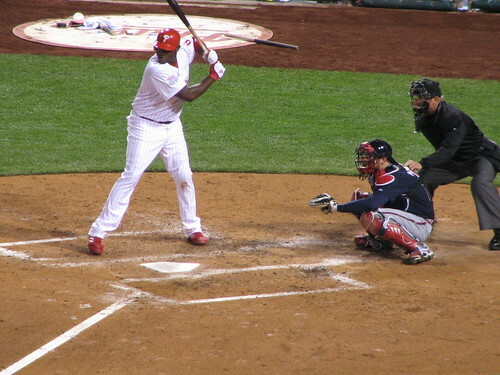 Good luck to the Phillies tonight against the Braves in the 2009 home opener! 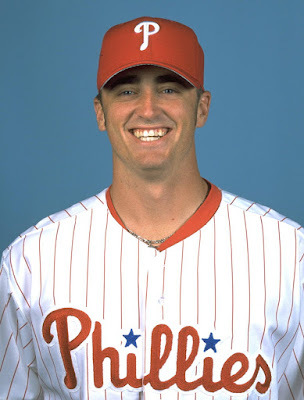 This is the third time that Brett Myers will start as the "Opening Day" pitcher for the Philadelphia Phillies, of course this time is "Opening Night". Brett Allen Myers has been a Phillies pitcher his whole career and he is starting his 8th year in the bigs. His pitching style has been to go right after the batter with fast ball after fast ball and over power the hitter more or less. This has been Myers' approach to pitching for many years, he had to adjust this last year when he was sent down to the minors and finished the season with a 10-13 record in 2008. His minor league record was interestingly 1-3 while he was down in the minors. Myers has to become more crafty as a pitcher to continue to be one of the top Phillies starters for the next few years. Myers has already shown that he can be effective in relief, and that may be where his bread and butter lies to continue as a pitcher if he doesn't have success this year as a starter. Myers still has what it takes to make him a serious contender for the top pitcher on the team, he still leads all pitchers with wins at Citizens Bank Park with 27 wins, tonight he could take that to 28. Myers has been through a rough time in the past couple of years, we was switched into a relief role for the team in 2007 and really did great, then the team went and switched him back into a starter and this alone could be a source for the problems that Myers had in 2008 during the first half of the season. Tonight will mark the start of the 126th season for the Phillies, last year was a season that will be tough to top. In fact, only one other National League team has won back to back World Series title since 1975-1976 when the Cincinatti Reds won it back to back, they were also known as the "Big Red Machine." The Phillies sort of have their own version of the 'big red machine' going these days. The Phils have a powerful lineup that looks poised to do some wrecking of teams themselves. Last year during the playoffs the team went 7-0 at home for the playoffs and they became the first team to do that since the MLB switched over to the current playoffs format in 1994. 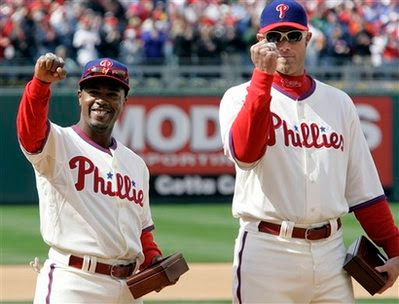 Tonight the stadium will be no doubt rocking, as the Phillies start their journey on the 2009 season. Game time 8:05 pm on ESPN2 - I'll be at the stadium for my first 'Opening Night' game, it should be fun. 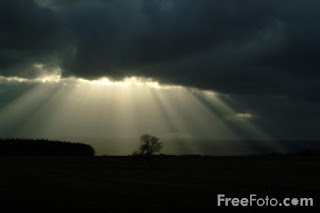 A long time ago, a blog was started by Mr. Mike Berquist called, "A Citizen's Blog". The blog was one of the most thought provoking blogs about baseball and specifically Phillies baseball that was available in the early days of blogging. I used to read the blog and other blogs about Phillies baseball and they really inspired me to go out and begin this blog and my other blog on Philly sports called www.phillywebcast.com. 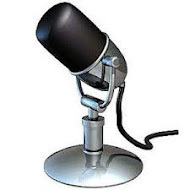 My interest in broadcasting also was satisfied with the podcasts or internet broadcasts that I produce on both websites, and a couple more on other subjects over the web. Mike called it a day on his blog last year, after 1000 posts. A Citizens Blog was to be restarted this year, but Mike decided against it- but he will post here on his own schedule whenever he feels like it, and appear on some Phillies podcasts over the season. So, tune into the blog throughout the season and follow another magical season that is Phillies baseball! 'Pat the Bat' finally got the respect of the fans, practically getting a standing 'o' on his homerun hit for the Tampa Rays. He'll be in town to get his ring on Wednesday afternoon with the Phillies! I was listening to last night's game on the radio. The Phillies were down by a run and the Rays were really looking like they would win this game. I started thinking about who would be the hero tonight for the Phillies on a comeback win. The team did this so much last year it seems kind of eerie that it happened again last night in Game 1 of the "On Deck" series vs. Tampa. I am heading up to the game this afternoon and will be getting some nice pictures of the game and festivities up at the stadium which I will be sure to share with you on this blog. Spring has finally arrived! I can't wait to get to the stadium. Phinally, The Phillies are back... will rain dampen today's game? The dawn of the 2009 Phillies season is almost near! The Phillies are back up north now to get ready for the 2009 campaign. Only 2 more preseason tuneup games stand before the Phillies before the home opener on Sunday night at 8:05 pm. Rain today on Friday may be a factor for tonight's tuneup against the Tampa Rays. 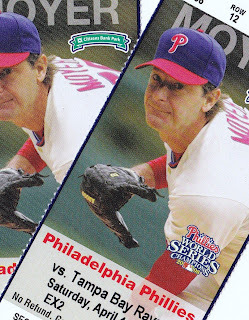 I will be up at the ballpark on Saturday afternoon to see the game, and I'll relay in this blog all that I see about the Phils and those Tampa Rays. In case you didn't read all about the Phillies in this blog or other similar blogs about the Phillies, just click here to read even much more about the team from the Philly Daily News in their great coverage of the Phillies. Check back at this site often during the season for many podcasts, specials, and other fun things that are planned for the season. We're even going to have live game chats set up for you to meet here and talk about the game!